Playing with a drone can be tons of fun for the entire family! As engaging as these flying gadgets can be, it can also be quite challenging to get it right, especially if you’ve never interacted with one before. But did you know there are specialized drone flying schools out there that can teach you all there is to know about how to properly operate the controls? Drone flying schools will teach you how to fly these things in no time! Apart from teaching you how to fly a drone properly, you will also get an education in how these fascinating machines work. That being said, learning how to operate the controls is not enough. You also need to be aware of all the local laws and limitations regarding what you’re actually allowed to do with your drone and the flying heights you need to have in mind. The best drone training courses are always structured in such a way the attendees receive a broad education. This includes learning how to properly clean, repair, and maintain your drone so it will last for years to come. 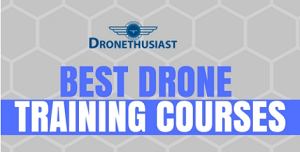 A good drone flying school will also familiarize you with how to have fun with your flying gizmo without breaking any laws or upsetting your neighbors. For example, there are certain restrictions regarding the level of noise the drones are allowed to produce, how close they can come to neighborhoods, the time of day you’re allowed to use them, and so forth. By taking the time to learn some proper drone etiquette, you’re not only doing your community a favor, but also making sure that your drone stays safe at all times. In the past, there have been countless accidents when the owners were not compliant with the flying safety guidelines, and as a result of that, their drones got destroyed or damaged in the process. By taking drone flying lessons, however, you will be well informed to avoid these kinds of accidents now and in the future. Great instructors will teach you all the flying skills you need, but excellent ones will make you enjoy the course and make it all seem like a game even your kids are likely to enjoy. After all, flying a drone should be fun. For those of you who prefer learning from the safety and comfort of their chairs at home, the great news is that we live in a digital age, which means there are plenty of online courses for you to choose from. Get drone flying lessons now! Once you know all the rules and have sharpened your flying skills, the rest is pretty much just fun and games. There are plenty of things your entire family can be doing with a drone, and by having a good education on the laws and regulations associated with their use, you will be free from worry about doing something wrong. So what are you waiting for? Get some drone flying lessons today!